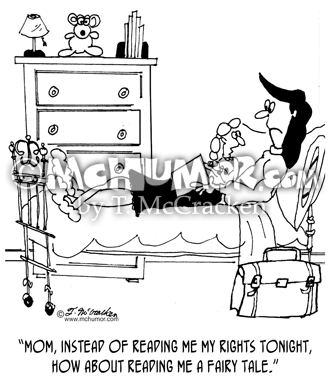 Lawyer Cartoon 7343: A kid in bed saying to her lawyer mother holding a card, "Mom, instead of reading me my rights tonight, how about reading me a fairy tale." 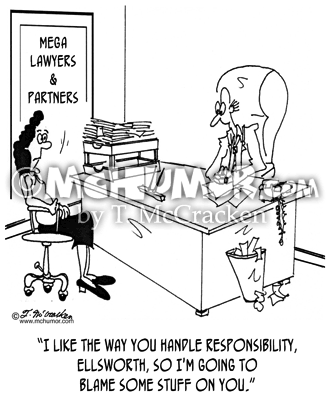 Lawyer Cartoon 7341: A partner says to lawyer, "I like the way you handle responsibility, Ellsworth, so I'm going to blame some stuff on you." 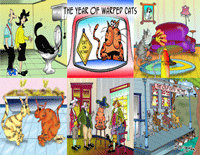 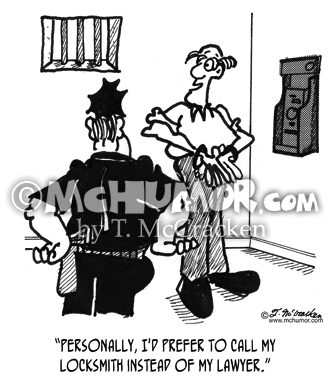 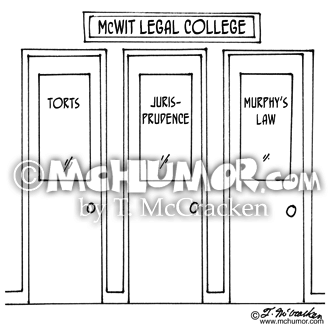 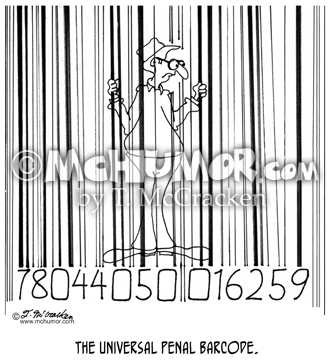 Law Cartoon 4465: Doors at a McWit Legal College "Torts," "Jurisprudence," and "Murphy's Law." 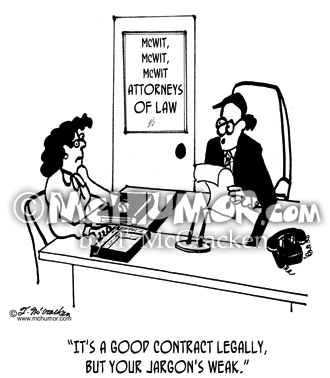 Lawyer Cartoon 4084: A lawyer reading a document saying to another, "It's a good contract legally, but your jargon's weak." 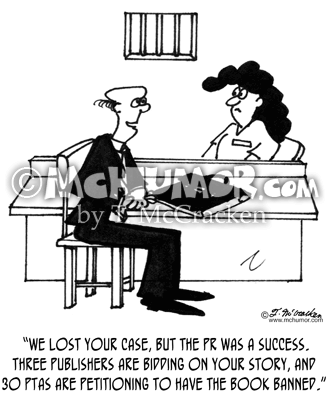 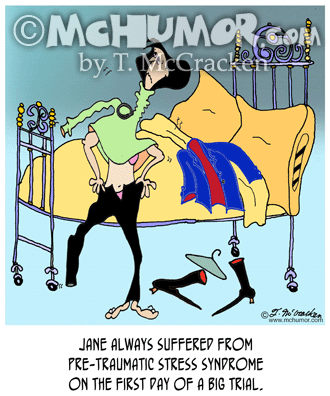 Lawyer Cartoon 8301: "Jane always suffered from Pre-Traumatic Stress Syndrome on the first day of a big trial." 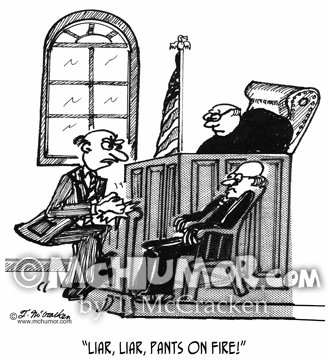 A woman is a nervous wreck and puts both of her legs into one pant leg and her head through a sleeve. 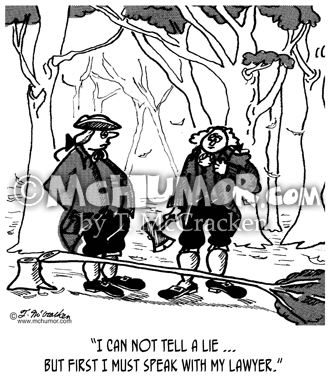 History Cartoon 2078: Washington in front of a chopped down cherry tree saying, "I can not tell a lie ... but first I must speak with my lawyer."